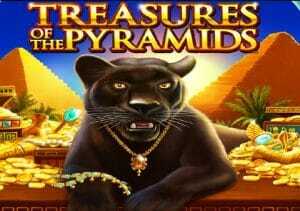 A big cat can deliver big riches in Treasures of the Pyramids, a 5 reel, 40 payline video slot powered by IGT. Available to play on desktop, tablet and mobile devices, this virtual trip to ancient Egypt comes with stacked wilds and a bonus feature that awards up to 600 free spins with all payouts doubled. Head to the desert from between 40p and £800 per spin. Treasures of the Pyramids has the look of a live casino game – the reels feature the usual lower value playing cards as well as 6 cartoon style Egyptian hieroglyphs. 5 of the eye of Horus or the eagle god will get you 500 coins. More lucrative too is the black panther which is the game’s wild – this lands stacked to fill up 2 positions on the reels. 2, 3, 4 or 5 panthers will get you a payout of 10, 75, 150 or 5,000 coins. The pyramid scene is the scatter – landing 3 or more of these anywhere on the reels triggers the Free Games Bonus feature. 3 will get you 8 free spins, 4 offer 15 with a massive 100 free spins awarded if you land a full complement of 5 scatters. There are extra goodies on offer too regardless of how many free spins you receive as all wins during the feature are subject to a 2x multiplier and doubled. You can re-trigger even more free spins if the scatters fall nicely with up to 600 to be won! Treasures of the Pyramids is a fairly simple video slot – the basic visuals are functional rather than things of beauty. Likewise, the backing track that owes little to the sounds of ancient Arabia. The game really comes into life in the bonus feature where the 2 high wild complete with doubling multiplier can quickly have an impact. On the variance scale, we’d put Treasures of the Pyramids in the medium range, offering a balance of payouts. There are certainly more lavish ancient themed games on offer than this – if you’re after simple, low fuss action that can still deliver some decent payouts, then Treasures of the Pyramids is one to consider. If you like ancient Egypt, IGT’s Pharaoh’s Fortune is highly recommended.